As should be clear by now, I'm a fan of Bluetooth speakers, both smaller pocket-size to enjoy your music, and larger units to better share the sound. 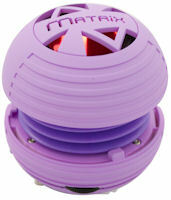 The portable speakers from Matrix Audio are clearly in the pocket-size category, but with a fun twist -- literally. 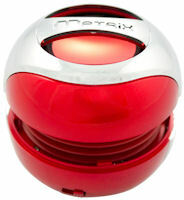 The Matrix nrg and Matrix one are spheres under the size of a pool ball (2 1/2 inches) with a speaker facing out the top. Plus, you can twist them around the equator to pop open the two hemispheres with an accordion-style connection for an extra sound boost. The Matrix nrg is a wired 3 watt speaker, with a standard 3.5mm input cable that wraps into the bottom that you can hook up to smartphones, music players, computers, and other devices. Plus there's a separate audio output connector so you can chain multiple speakers. It has a durable rubberized coating, with power switch and volume control, and is available for $29. 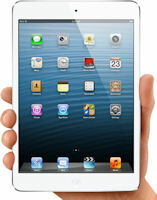 See my update on holiday gadgets -- Portable Accessories - Fall 2012 -- for more on portable devices and accessories. The Matrix one is a 3.5 watt Bluetooth speaker that adds a mic to also work as a speakerphone. The control switch provides wireless control to play/pause, pick up and hang up calls, and skip tracks, plus control volume in the speaker. You also can use the speaker with a wired connection with the included miniUSB splitter cable with power (USB) and audio input (3.5mm) connectors. It's priced at $79. Both charge though a miniUSB connector, and provide up to 14 hours of playback. These are clever little speakers that perform as advertized to let you better enjoy your music, with the added bonus of the pop-open sound boost. See my update on gadgets -- Portable Accessories - Fall 2012 -- for more on portable devices and accessories. We think of wireless for music, as in Bluetooth, and wireless for networking, as in Wi-Fi. And Wi-Fi is about Internet access -- Our home router turns the hard-wired Internet connection into a wireless hotspot so we can go online with our laptops. And now our smartphone also can be a hotspot, turning the cellular data service into a local cloud for our tablets. But Wi-Fi is not just a pipe to the Internet. You also can embed Wi-Fi into a device to allow it to be accessed remotely, as with wireless printers. Another great use of wireless in these days of small portable devices is in hard drives for portable storage. After all, your smartphones and tablets have limited built-in storage, and you don't necessarily want to download a mass of large files to them. These handheld portable devices also are not particularly good at sharing with others, for example to allow friends to sample your music or copy your photos or documents. The solution, then, is to use a Wi-Fi enabled disk drive that creates its own wireless hotspot, so that you and others can browse and share its contents. For example, the Seagate Satellite Mobile Wireless Storage (formerly GoFlex -- see earlier post) provides a hefty 500 GB of hard disk storage for around $174 (street). Or for an even more portable solution, the Kingston Wi-Drive Wireless Storage is ridiculously thin and light at only 4.8 x 2.4 x 0.4 inches, yet can pack from 16 GB to 64 GB of flash storage, for $69 to $185. That's enough storage to double the capacity of the largest iPad or iPhone. This means you can bring along large collections of your favorite photos, videos, and music that you can stream and play anywhere -- and simultaneously share with up to three users. You set up the Wi-Drive from your computer like any removable drive through the USB connection. Just drag and drop to copy your large collections and files, without worrying about syncing big files to smartphone or tablet (especially painful though cloud services) or spending time managing their storage to avoid running out of room. Then access the drive wirelessly though your device's Web browser to view and play files, or use the free Wi-Drive Apps for iOS and Android. As a bonus, the Wi-Drive also works as a removable storage device with your smartphone or tablet (or laptop). You can browse the folders and files, copy (upload and download), and delete files. As a result, you can use it as a convenient way to transfer files between portable devices (that don't have slots for removable storage), or even between laptops (instead popping a thumb drive in and out each time). And as a double bonus, you don't even have to give up your normal Internet connection while connected to the Wi-Drive -- It supports a bridged network connection option that lets you both access the drive and connect through to the Internet. The Wi-Drive has a rechargeable battery that runs up to four hours, so it's a really convenient way to enhance your portable devices by wirelessly expanding their storage and sharing files. The [Fuse]Chicken Une Bobine is a clever idea, nicely executed, albeit oddly named. It's a standard iPhone or microUSB cable for charging / syncing your smartphone -- that's also a stand, since it's built from a flexible metal goose-neck cable strong enough to hold the phone. So maybe you should instead think of it as a poseable smartphone stand that also happens to be a USB cable. With the Bobine you can securely position your phone horizontally or vertically, placing it lower for reading or watching videos, or higher for FaceTime video conferencing. It also can hold the phone steady for shooting photos or videos, or can position the phone in the car. The Bobine comes in two sizes, the Une Bobine with a 2 foot cable for $30, and the Petite Bobine with a 1 foot cable for $28. Each is available in two models, with a microUSB connector or with the Apple 30-pin dock connector for iPhone or iPod touch. An additional Lightning cable adapter for the iPhone 5 is coming soon. Une Bobine is the creation of [Fuse]Chicken, an Ohio-based designing and engineering studio that funded the product development as a Kickstarter project. Oh, and the name is French for "A Coil". Nice twist. Apple is certainly ready for the holidays after updating its entire product line of portable devices this Fall. Not content with announcing the iPhone 5 in September, plus the updated iPod touch gen 5 (without the phone part -- see earlier post) and iPad nano generation 7 media player (see earlier post), Apple has just surprised the prognosticators by refreshing its iPad tablet line. From a consumer electronics perspective, the iPad was out of phase with the holiday shopping season, with its annual updates released in March -- not only missing the gifting season, but also delaying holiday purchases for the next even better thing. So for this week's announcements, Apple introduced not only the long-rumored iPad mini, but also a brand new top-of-the line iPad gen 4, which instantly obsoleted the iPad gen 3, released only seven months ago. And the iPad gen 3 was no slouch as an upgrade to the iPad 2, adding the higher-res Retina display with four times the resolution, 5 MP iSight back camera, quad-core A5X chip with double the graphics performance, and much faster 4G LTE cellular service. This was a beautiful looking tablet with matching hardware performance. As we now expect, Apple did not change the pricing of the new, better iPad. It starts with the 16 GB model at $499 for the Wi-Fi version or $629 for the Cellular version (so you can sign up for LTE service). Then add $100 to step up to 32 GB of storage, or another $100 for 64 GB. And while the iPad gen 3 was retired and replaced by the new gen 4, the older iPad 2 from March last year is still available with 16 GB for $100 less -- $399 (Wi-Fi) or $529 (cellular). 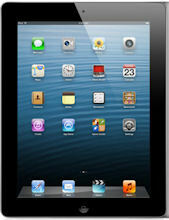 This gives Apple a $399 tablet, but that $100 step-up to the new model sure buys a lot. So where does the new iPad mini fit in? With a 7.9" display, it's slightly larger than your typical 7" tablet (like the original Amazon Kindle Fire). Apple boasts that the extra 3/4 inch diagonal gives you 35 percent more screen real estate, which it argues makes a big difference in viewing content like web pages in portrait mode. But the cleverest move was to have the display the same resolution as the iPad 2 (1024 x 768), so existing iOS apps should run cleanly on the new device. The overall size does grow as well -- the Fire is 7.5 x 4.7 in., while the iPad mini is 7.87 x 5.3 in. -- though that's still feasible to rest it in your open hand. In comparison, the full iPad is 9.50 x 7.31 in., which is definitely two-handed. Of course, Apple also focuses on thinness and weight -- the iPad gen 4 is 0.37 in. thin and weighs 1.45 lbs., while the mini shrinks to 0.28 in. and 0.69 lbs -- Apple describes the mini as 23 percent thinner and 53 percent lighter than iPad gen 3. In comparison, the iPhone 5 is 4.87 x 2.31 x 0.30 in. (thicker than the mini), and 0.25 lbs. And how do the iPad mini's specs compare to the new gen 4? The hardware elements are fully loaded, with 5 MP iSight back camera, FaceTime HD front camera, full 1080p video recording, and dual-band Wi-Fi like the iPad gen 4. Plus it also supports the Siri voice assistant. However, with the lower resolution on the smaller screen, the mini is powered by the same dual-core A5 chip as the iPod 2. All three have a battery life speced at 9 to 10 hours. Apple indeed should be feeling quite refreshed for the holiday shopping season. See my Apple iDevices Gallery for more details and comparisons on the current -- and past -- Apple iOS devices, including the iPods, iPhones, and iPads, as well as product chronologies. And see my update on holiday gadgets -- Portable Accessories - Fall 2012 -- for more on portable devices and accessories. Entries posted to Manifest Tech Blog in October 2012, listed from oldest to newest.